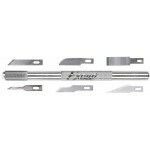 K5 Knife w/ Safety Cap. With 7/16" aluminium adapter, 4 jaw machined aluminium chuck for secure blade positioning and a snug fitting plastic Safety Cap for your protection. 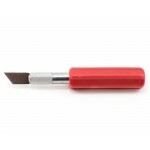 ..
Excel's Executive Retractable Knife. 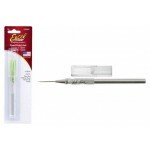 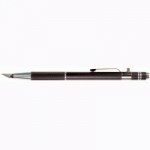 Made In The USA..
Excel 30604 Needle Point Hobby AwlUsed for scribing, retouching, stenciling, making holes, and marking pointsHardened carbon steel tip with an aluminum handleIncludes K1 Safety CapAwl length is 7/8 inchOverall length is 6 inchesMade in USA.. 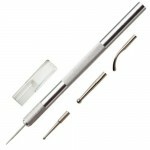 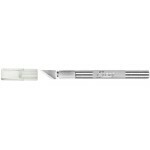 Fits Excel knife CT456 (#16004), rotates 360 for cutting circles on film or paper. 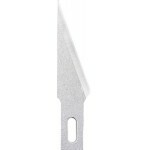 0.812 x .125 x .125 Edge..
K1 Stencil Knife Handle only w/ 6 Assorted Blades5/16" x 4 3/4" with 4 jaw machined aluminium chuck for secure blade positioning.Includes Super Sharp Blade and a snug fitting safety cap or scabbard for your protection. 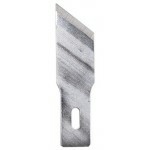 Used for precision cutting, trimming, and stripping of paper, plastic,..